Fassinating Fassbender - A Michael Fassbender Fan Blog: So Glad This Oscar Season is Over! So Glad This Oscar Season is Over! When you look at the larger picture, it was very, very important for the film, 12 Years a Slave, to win the Best Picture Oscar. It could not win that honor alone, it also had to have the support of at least 2-3 other awards. Well as it turned out, the film won Best Supporting Actress and Best Adapted Screenplay. For a highly contentious, competitive and emotional awards season, I am fully supportive and pleased with the results. Sure, it would have been better if Michael Fassbender really had a fair chance. But his character could not win against a man playing a transgendered woman dying of AIDS while helping other people get easier access to the HIV drugs to help them survive. It was a done deal months ago as history reveals that AMPAS feels more comfortable and better about themselves in supporting the work of a character that they can go to sleep at night, in peace, knowing they supported an important issue and cause. So the point is moot in complaining about the system, it is what it is and it's not going to change. I also feel bad that Chiwetel didn't win, or Leonardo DiCaprio for that matter. These actors may have to consider taking a role of an AIDS patient one day, and I say that with all seriousness. I've seen all five performances and the actual winners in this case, were not the better performances. That's my final word on that. It appears that Michael had a restroom break when Lupita was announced the winner. He's congratulating her afterwards. I hope I never experience another awards season that was as polarizing and political as this one. The people who were hateful towards 12 Years a Slave really need to look deep within themselves and ask why do they harbor such resentments towards this brilliant film. Most will refuse to acknowledge the obvious, while others will be in denial, and some will gladly admit that they have racists attitudes. In the end, AMPAS voted in a way I totally agreed with, and 12 Years a Slave IS the Best Film of 2013. I am also very proud of Lupita Nyong'o for winning Best Supporting Actress. I recall late last year that of all three performances, hers, Chiwetel and Michael's, I would sacrifice them winning the Oscar, for her to win hers. Why? She stole the film from Chiwetel's Solomon. We empathized with her, was scared for her, we hoped for her... and to this very moment, we don't know what happened to her in her final days of life over 100 years ago. 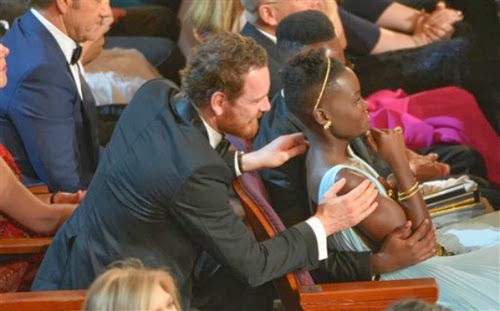 A win for Lupita was a celebration of the life of the tortured slave girl, Patsey. I don't think she even had a last name, that's how tragic her life was. Also, Hollywood has not embraced actresses like Lupita, and with her win, I hope that changes drastically. She's got it all, beauty, class, talent, and an Oscar, and I hope we see a lot more of Lupita.